14 Months into a Merger: Phil Saunders covers how he merged two sales departments, pre and post merger issues, healthy paranoia and merging cultures. 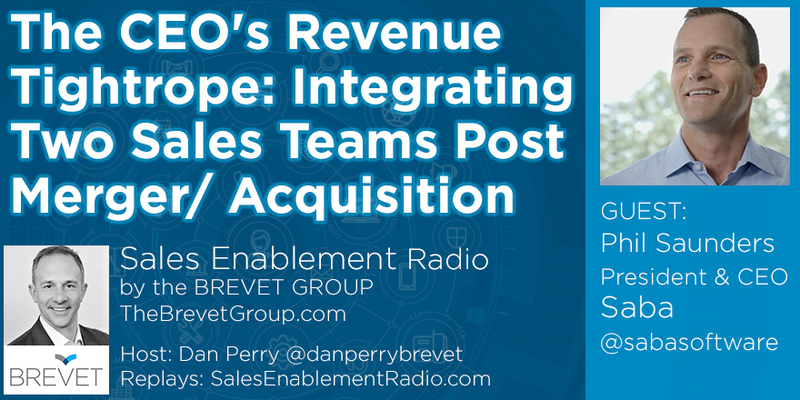 During this program on Sales Enablement Radio, host Dan Perry (The Brevet Group) interviews Phil Saunders, CEO of Saba Software, the talent management technology company. Integrating two great sales teams - post merger. Getting employees to focus on the right tasks during and after the merger. Even the best plans bring surprises. Say, what is healthy paranoia? What could have been better and what went well. Which culture wins in a merger? The answer isn’t what you think! Two must haves: keeping the best customers and best people during the merger. Phil Saunders is CEO of Saba Software and serves on the board of directors. A passionate people- and customer-focused leader, Phil is responsible for guiding Saba's vision and strategy across all product and go-to-market functions, business operations, and talent and culture initiatives. The average person will spend nearly 100,000 hours of their life working. Saba's mission is to help clients create a work experience for their people that's more engaging, inspiring and empowering — an experience that transforms the working lives of millions and creates more growth and success for every business. Saba provides the power of 1,000 talent experts focused solely on living that mission, and helping HR leaders transform their people strategy and talent experience, while delivering tangible impact to the business. On Sales Enablement Radio we talk with CEOs and authors, Chief Sales Officers, Chief Marketing Officers, Vice Presidents of Sales Enablement and Sales Operations, as well as salespeople about sales enablement. We started Sales Enablement Radio because sales enablement is a contested, hot topic for companies struggling with the new reality of selling in the B2B space. Marketing and sales departments are confronted with pressure to work as a team, while using new software guided by artificial intelligence, while contending with prospects that demand more information with less personal contact before making a purchase. This program will bring clarity to a topic that seems to mean different things to marketing, sales, and C level managers. how they integrated two great sales teams - post merger. how to get people to focus on the right tasks during and after the merger. how even the best-laid plans can bring surprises. the definition of healthy paranoia. what went well and what could have been better. how culture in both organizations in a merger can be brought to a win-win. how to address keeping the best customers and best people during a merger. Copyright 2019 The Brevet Group. All rights reserved.